I tell ya, one of my favourite foods is Salmon. But my friend, Wade Bradley; you know, the guy behind Bradley Smokers, he loves salmon. He’s a West Coast guy, and he loves his salmon. So this is a recipe I’m making for Wade. This is a side of salmon, weighs about 3 to 4 pounds this side, and we’re just going to square it up so I have a nice uniform fillet. And I’m just going to square it as well on the front. 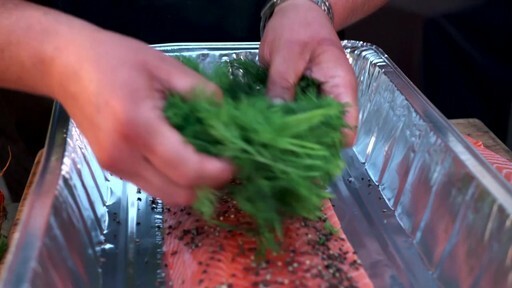 So, we’re going to take a foil pan, put that salmon in right down there in the middle. 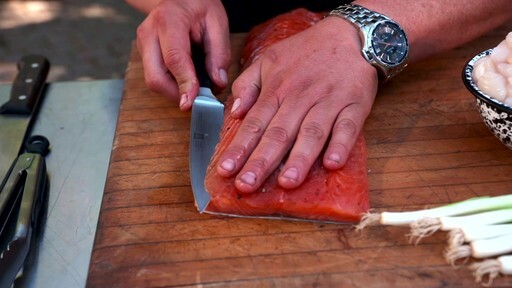 And I like to run my fingers there along the salmon and push it nice and tight so that it plumps up. Take a little bit of black pepper, don’t need a lot just a little. Sprinkle that over top. Rub it into the flesh so that it adheres. A fresh bunch of dill. 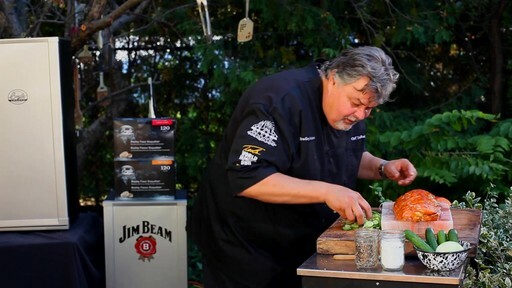 A little bit of bourbon, you can use brandy, you can use rum, whatever you desire. It’s about half a cup’s worth. Push it down, push it down. Here’s salt. You can mix it in a bowl if you wish. This is just simple. This is just some sugar, break it up. The bourbon is sweet so you don’t have to add a lot of sugar into this, but just a little bit. Another layer of salt all the way along. Back one more round with the sugar. Look at that. One final pass with the salt. Push it all in. A little more of the good stuff. You’re going to wrap this and put another pan on top of it and then you’re gonna weight it and press it. Put it in the refrigerator and let it sit there for 24 hours. 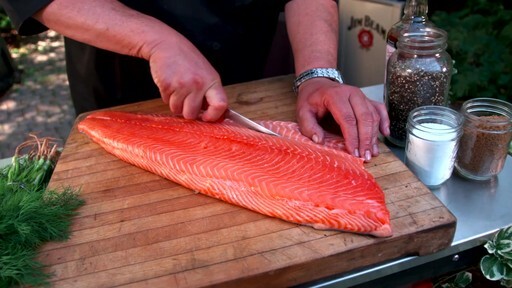 You can see that our salmon here is now cured for 24 hours. And you’ve got a lot of moisture coming out of it. That’s a little bit of the bourbon and the salt and the sugar and it kind of dries the salmon and tightens it up, give us a nicer texture. This one here we’ve removed the dill, and the salt, and the sugar, and we’ve rinsed it and patted it dry and then put it in the refrigerator and let it chill for a couple of hours to dry out. So we’re going to stuff this. Let’s get to opening it up. You need a sharp knife for this. I just start here and make an incision all the way along. Start back at the top. Pull it in here just like that. We’re gonna put our scallop stuffing in. All the way along. 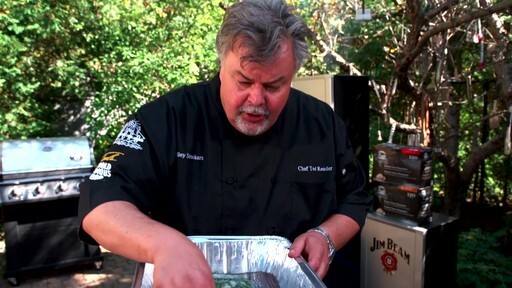 And when you get into this part, smart little tip for ya, it’s to let’s get it on the tray. It is easier to stuff when it is on the tray. We are gonna put our bay scallops in there. You’re gonna need about 2 cups. Get a knife. Off comes the green. Smash your green onions. Why do you smash them? You wanna extract all that onion juice out of them, so it’s a good way to do it. And then, coarsely chop it, like that. Salt, pepper. It’s a very very simple stuffing. Lemon. Now we’re gonna zest it. A nice big burst of acidity in this. Gives you layers upon layers of flavours. Take your lemon. Squeeze the juice over top, just like that. We’re gonna mix this up. 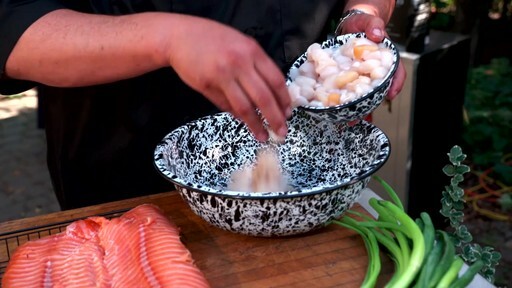 Now you take your scallop mixture and just lay it evenly over the surface of the salmon. Black pepper on the inside of the salmon. Not too much salt, but just a little extra. Fold it over. Bring it around, stuff it in. All set to go in our smoker. Set the temperature at 180 degrees, we’re gonna pop it inside, and we’re gonna crack ourselves a cold one while it smokes. Here we go. You ready, oh look at that. So hot. And now we’re gonna take some honey. 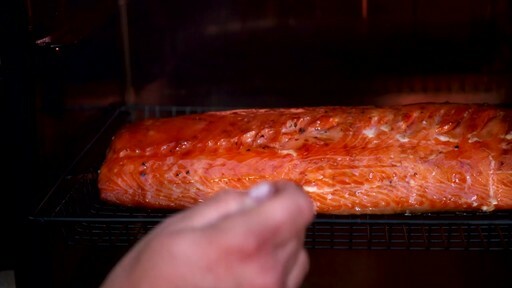 Beautiful salmon, all shiny, smoky, sweet and delicious. Oh, look at that. Cooked to perfection, oh the scallops, oh my god. One more right here, look at this coming on in, honey-glazed. Oh wait, I think you’re going to like this. Look at that. Cucumber salad, everyone gets a little bit, right there on the edge. There you have it. 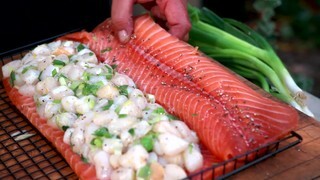 Cured smoked salmon stuffed with bay scallops and lemon and mashed green onion. Hot smoked at 180 degrees for a couple of hours, glazed with honey, brought out and served with a little cucumber salad, let me tell you it doesn’t get any better than this. 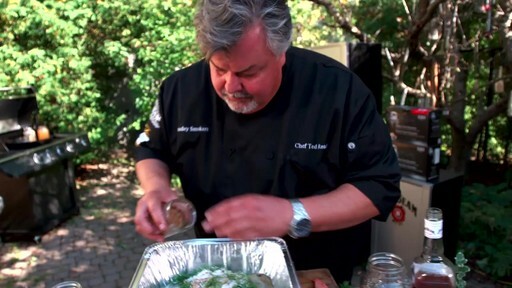 Bradley Smoker makes it easy and makes it absolutely delicious.